Sluggo's Museum of Classic Pop Culture: The Most Incredible Guitar in Rock History! In November of 1984, I got my first guitar. It was a black Cort Les-Paul copy that I had first seen advertised in the Sears Catalog. As cheap and imperfect as that instrument was, I loved it dearly, and practiced way into the morning hours, even on school nights. I became an avid student of the guitar, and hungered for any and all information I could find on how to unravel its secrets. Some of my guitar-playing friends were really into reading Guitar Player magazine, so I figured that would be a good place to start. Sometime in the summer of '85, I picked up the Eric Clapton issue, hoping to learn the solo to "Sunshine of Your Love. The first thing that caught my eye in the issue was this beautiful guitar, hand-painted by the Dutch "painting duo" known as "The Fool." The caption indicated that it had once belonged to Eric Clapton during his "Cream " days, but that he had since sold it to Todd Rundgren. 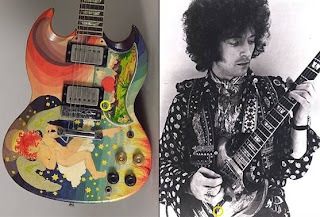 Two of my biggest musical heroes had both played this work of art, and the guitar instantly took on a mystic significance in my mind, aided no doubt by the whimsical, psychedelic artistry covering every part of the instrument. I kept plugging away at learning rock guitar, and worked meticulously on the "Sunshine of Your Love" solo. All the while, I imagined myself playing that beautiful SG . As I listened to the record over and over again, I concentrated on the fact that Clapton was making those amazing sounds with the specific instrument I'd been daydreaming about. As I graduated high school, I really started to discover the musical genius of Todd Rundgren. "Hello, It's Me" is my all-time favorite AM-radio hit, but I quickly realized that there was much more to Rundgren's music and sound. Underneath all the glam-rock fashion and pop melodies was an incredible rock guitarist with a unique style and sound. I always felt that his music connected with me on a very personal level, and this feeling was enhanced by the knowledge that he was playing the magic axe. A few years ago, I was watching Todd Rundgren on the Conan O'Brien show. 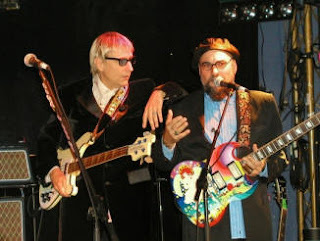 A few nights later, Jimmy Vivino of the Max Weinberg Seven suddenly held the spectacular SG in his own hands during a house band number. Thinking that maybe Todd had sold or given the guitar to Vivino, I emailed the Conan show, and was very surprised and delighted to hear back from Jimmy Vivino himself a few days later. In fact, the guitar was so famous that several high-priced replicas had been made, and Vivino had purchased one. It also turns out that Todd Rundgren had paid Clapton a mere $500 for the instrument, and consequently sold it for half a million years later. As for me, I graduated from the Cort replica to a real Les Paul, and later a jet-black SG, as well. I love my guitars, but if I ever win the billion-dollar lottery, the magic SG is one relic I just might try to acquire. Awesome looking guitar! I had forgotten about it, but now I remember you showing me pictures of that guitar many years ago. I actually have become a much bigger fan of Rundgren in the past few years than I used to be (Thanks to youtube). That is an amazing performance, Dave! Always loved that song, and remember seeing that live on Letterman when it happened. Check this one out: this is Utopia, from Don Kirschner's Rock Concert in 1974. Very prog-rock type of song (Utopia Theme).